A senior Hezbollah leader said the Iranian-backed terror group is ready to wage war against Israel in the Golan Heights. Hezbollah’s deputy secretary general Naim Qassem said in a recent interview that Syrian President Bashar al-Assad is ready to make good on a threat to bring his country’s civil war to Israel. "I believe that the Syrian leadership is serious about opening the Golan front," Qassem said in a May 25 interview that was translated Monday by the Middle East Media Research Institute (MEMRI). "After all, it was President Bashar who declared the opening of the Golan front," Qassem was quoted as saying. "The implementation is dependent upon objective circumstances." Two Hezbollah leaders survived an assassination attempt on Monday, according to regional media reports. Unknown assailants attempted to kill Sheik Maher Hammoud, who is close to the terror group, Al Jazeera reported. "Security officials said Hammoud was walking from his home in the port city of Sidon to the al-Quds Mosque where he preaches early on Monday when unknown men in a moving car opened fire," Al Jazeera reported. Hezbollah has emerged in recent weeks as a key force in Syria’s years-long civil war. The terror group has been fighting rebels on Assad’s behalf at the request of Iran’s supreme leader. As the terror group takes the lead in several key Syrian provinces it also has suffered major casualties, calling into question the group’s preparedness for such an operation. However, Hezbollah leaders have said they will commit anywhere from 2,000 to 3,000 troops. Qassem reiterated Hezbollah’s commitment to fighting Israel on Assad’s behalf. "We believe that the level of our involvement in some operations [in Syria] that are consistent with the way we see things is legitimate, required, and obligatory," he said in the interview with Lebanon’s Mayadeen TV. "This is part of protecting the resistance enterprise, protecting Syria of the resistance," he said. "If not for that—the fighting, the liberation, and the tipping of the balance in favor of the regime would be the responsibility of the regime itself, and indeed, the regime is taking care of that, and so is the Syrian people, fighting alongside the regime." Israel has threatened to respond aggressively should Hezbollah or other pro-Assad forces launch attacks on its northern border. 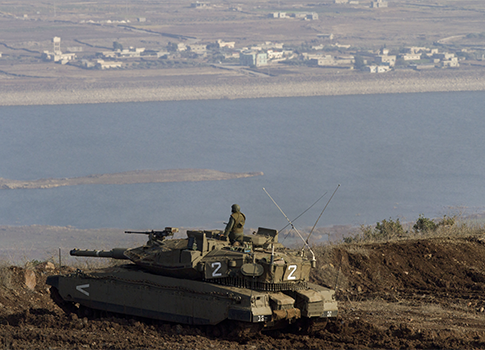 However, Hezbollah has massed its forces in the Golan Heights despite this threat. "We, in Hizbullah, have said that we are prepared to help and to participate in this," he said, noting that "Hizbullah cannot be the one to open the front in the Golan." "A front is usually opened by the people of the relevant country," Qassem said. "When Syria decides to open the Golan front—if it requires anything from Hizbullah, we will be ready to help anyone conducting resistance against Israel." Meanwhile, Israel has also threatened to attack Syria should it receive a shipment of Russian made anti-aircraft missiles. Israeli officials reiterated their stance on Monday, but said that there is not yet evidence the shipment has been made. This entry was posted in National Security, Politics and tagged Bashar al-Assad, Golan Heights, Hezbollah, Israel, Middle East, Syria. Bookmark the permalink.